Does anyone success to run Vertica ML at Knime 3.X? If you have a successful workflow file, could you share it with me? As far as I am aware KNIME support in-database processing as mentioned in this link. However, I am not aware that KNIME uses Vertica ML function directly. I am trying to work with the Partner on getting them to use Vertica ML instead of pulling data into KNIME Server. BTW: We have published connectivity guide for the same. 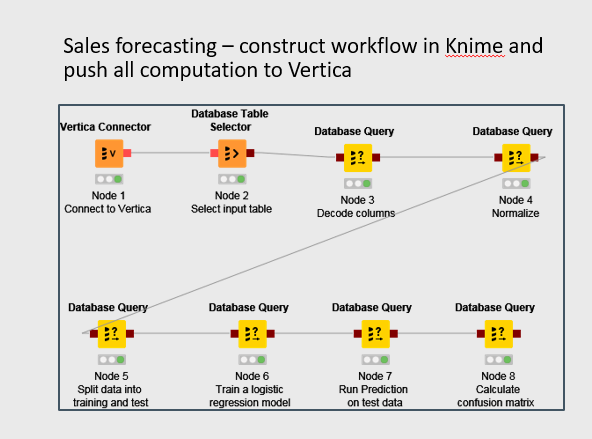 Please send me an email if you have a customer that want to use KNIME with Vertica. Thank you for your support. It looks like that we can write Vertica ML at "Database Query" Block at the above flow chart. But no luck still.